The angel Gabriel (Christopher Walken) comes to Earth to collect a soul which will end the stalemated war in Heaven, and only a former priest and a little girl can stop him. Viggo Mortensen plays the fallen angel Lucifer, who’s come to stop Gabriel for his own reasons. The film combines dark comedy, fantasy, suspense, and a dash of horror. The plot is hard to follow, even incoherent, but the acting is good enough other deficits can be overlooked. Walken is matter of fact and outrageous as Gabriel, and Mortensen plays Lucifer with zest and more than a dash of humor and irony. There are strong supporting actors, including a short but delightful performance by Amanda Plummer as Rachel. From Amazon.com: A prime candidate for cult status (it even spawned a sequel), this apocalyptic 1995 horror flick belongs in the darker corners of the comedy-horror sub-genre that includes Buffy the Vampire Slayer, Mimic, and Phantoms–and like those movies it’s a mixed blessing with some highlights worth savoring. This one’s got Christopher Walken in its favor, starring as the Angel Gabriel, who’s really mad at God for allowing humans into heaven (because, you see, humans have souls and angels don’t, and God plays favorites). Gabriel takes his anger out on the human race, coming to Earth to capture the soul of the most evil human alive in an effort to defeat the “good” angels that remain in God’s good graces. One of the good angels is played by Eric Stoltz, who captures the evil soul before Walken does and transfers it into the body of a little girl. Are you with us so far? Don’t worry if you’re not, because writer-director Gregory Widen filled The Prophecy with so many wild ideas that he didn’t bother to connect them to a coherent plot. Add Viggo Mortensen as the devil and Elias Koteas as a priest-turned detective who’s tracking Walken and it’s clear that Widen was attempting something ambitious here. He nearly succeeded, since The Prophecy jumpstarts its heaven-and-hell rivalry with enough action, humor, and intelligence to make the movie sufficiently entertaining. It was enjoyable enough to entice Walken back for the sequel, so if you’re into this kind of thing, this one’s a keeper. Viggo comments on his pre-1999 movies, including Prison, Leatherface, Reflecting Skin, Indian Runner, Crimson Tide, The Prophecy, G.I. Jane, A Perfect Murder, Psycho. He also discusses his art and upcoming showings. Finally, when asked, "In twenty years, would you rather be remembered as an actor who painted or a painter who acted?" he replies, "I'd like to know that I was honest. I was myself as far as just being an artist and being an actor or poet or photographer or painter or whatever the hell. Being an artist is being an artist. So just be." 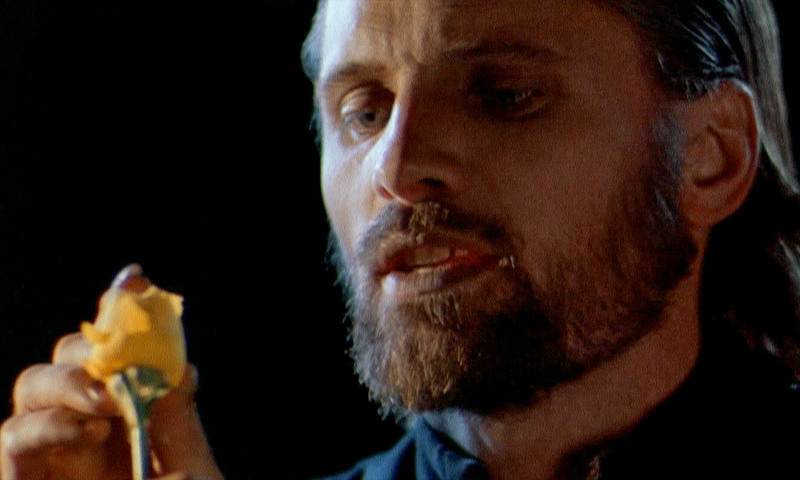 Video clips from The Prophecy featuring Viggo Mortensen as Lucifer. Also the official film trailer (no Viggo), and a sampling from David C. Williams’ original sound track. Williams also composed the OST for American Yakuza. Images © Neo Motion Pictures / Overseas Film Group.